This film is so understated that you should watch it without distractions. It's not a background noise movie. Birch impeccable as alienated teen in sardonic take on underworld comic book "Ghost World"
It seems only natural that eccentric underground director Terry Zwigoff would follow up his acclaimed documentary of eccentric underground cartoonist R. Crumb with an adaptation of an eccentric underground comic book. But "Ghost World" is more than an adaptation -- it truly looks and feels as if the pages of the 1990s teen alienation anthology have come alive. Every shot is photographed like a frame in a comic book. The palate of primary colors is an homage to the art form (although not directly to "Ghost World," which was drawn in black and white). The terse but pithy characters even speak in musing snippets short enough to fit in a dialogue bubble. And each of those characters is so well drawn -- in terms of performance, body language and wardrobe -- that simply looking at a still from the movie you can glean their entire personalities. Published in the mid-90s, "Ghost World" was a comic about two misanthropic out-crowd teenage girls set adrift after high school graduation in a loathsome, nondescript semi-suburban world of Starbucks and strip malls. They have a plan to find McJobs and get an apartment together, but stubbornly proud pariah Enid (played with pitch-perfect, sardonic, anti-social waywardness by "American Beauty's" Thora Birch) is procrastinating, subconsciously unwilling to grow up and become just another cog in the wheel. A thrift shop and Doc Marten's kind of girl with a jet black bob and nouveau Buddy Holly peepers, Enid spends the days immediately following graduation clinging to her subversive immaturity with her more mainstream bosom buddy Rebecca (Scarlett Johansson, "The Horse Whisperer"). In one scene that proves pivotal later, they play a practical joke on a miserable sap named Seymour (Steve Buscemi) by answering his pathetic personal ad, then hanging out at a counterfeit '50s diner (that plays hip-hop on the juke box) to snicker while watching him get stood up. But before long the girls begin drifting apart. Rebecca moves on, getting a job as a chain store coffee slinger and hunting for an apartment. Meanwhile Enid stagnates, in part because she's stuck in a suffocating summer art class she needs to get her diploma, but mostly because she can't see her way clear to any kind of future that doesn't make her want to gag. 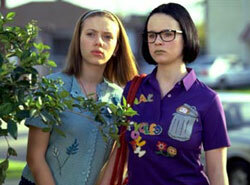 What's refreshing about "Ghost World" is that it's not a pat depiction of adolescent aimlessness or angst. These girls are not stereotypes in any way (although fans of MTV's "Daria" may recognize some of Enid's personality traits), yet thanks to the talents of Birch and Johansson we quickly come to know them well enough to understand how they think. For example, without the topic even being discussed we know that Rebecca is the kind of girl who takes petulant pleasure in shooting icy "you gotta be kidding me" stares at guys who come on to her. We also gather that Enid is silently jealous of Rebecca for even having the opportunity. All pent-up cynicism and inherent geekiness, Buscemi couldn't be more perfect in his role, which Zwigoff has admitted was written (by himself and "Ghost World" creator Daniel Clowes) as a thinly disguised version of himself. Other adult influences in Enid's life are nothing but flakes. Her art teacher (Illeana Douglas) is a faux-funky elitist who looks down her nose at the illustrated diary kept by our heroine, and her bewildered father (Bob Balaban) is little more than background noise in her life. Ultimately, this wry ironic comedy isn't about Enid's world, but about her own frustration with setting out on the road to self-discovery and coming to a dead end. It's an extraordinary 180-degree turn from the kind of romanticized, sexualized, pat-on-the-head assembly-line teenager flicks cranked out several times a year in Hollywood. PS: It's worth your while to stay through the credits.